Fred Owen "Dippy" Evans Jr. (May 23, 1921 – June 21, 2007) was a professional American football halfback who played for three years in the All-America Football Conference (AAFC) and the National Football League (NFL) in the late 1940s. Evans grew up in South Bend, Indiana and attended James Whitcomb Riley High School. He went to the University of Notre Dame and played halfback and fullback on the school's football team starting in 1940. After graduating from college, Evans joined the United States Army Air Corps during World War II, where he stayed until his discharge in 1945. He then signed with the Browns, a team in the new AAFC, where he played for one year. He subsequently played for the Buffalo Bills, the Chicago Bears and the Chicago Rockets in 1947 and 1948. Evans moved to Cleveland after his playing career and owned a dry cleaning business. He died in 2007. Evans was born in Grand Rapids, Michigan and moved to Detroit before his family settled in South Bend, Indiana. Evans attended James Whitcomb Riley High School in South Bend, where he played football, baseball, basketball and track. He was named an all-state halfback in his senior year. Evans attended the University of Notre Dame, where he played at left halfback for the school's football team starting as a sophomore in 1940. He moved to fullback the following year, when Notre Dame went undefeated under coach Frank Leahy. 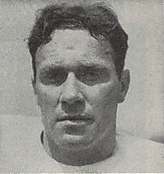 Evans led the team in rushing yards and scoring in 1941. Evans was considered shy but tough. Before a game against the University of Southern California (USC) in 1941, Bill Riordan, a teammate, poured a bucket of water over Evans's head. Evans tried to retaliate but crashed into a wall and split his knee open. He concealed the injury from Leahy and played in the USC game, but needed 11 stitches afterward. After graduating in 1942, Evans was drafted by the Chicago Bears of the National Football League. His professional football career, however, was delayed by service in World War II. Evans signed up for the United States Army Air Corps and flew P-51 Mustangs with the Flying Tigers, a unit that defended China against Japanese incursion during the war. While in the air corps, Evans played for the Randolph Field Ramblers, a military team at Randolph Air Force Base in San Antonio, Texas. Randolph won the national service title in 1944, when Evans was on the team. In 1945, Evans became the fourth player signed by the Cleveland Browns, a team under formation in the new All-America Football Conference, which was to start play in 1946. Evans was the first player to score points for the Browns in their inaugural exhibition game on August 30 against the Brooklyn Dodgers at the Akron Rubber Bowl. He scored a touchdown on a seven-yard pass from quarterback Cliff Lewis; he later intercepted a pass and returned it 83 yards for another touchdown. Later in the season, Evans twisted his knee and was sidelined for more than a month. The Browns went on to win the first AAFC championship in 1946. Before the beginning of the 1947 season, Evans was sent to the Buffalo Bills in a special draft designed to help the AAFC's weaker teams. He played for the Chicago Rockets and Chicago Bears in 1947 and 1948. Evans came back to Cleveland after his football career and owned a dry cleaning business called Handee Cleaners in the city's West Park area. He transferred ownership of the business to his son Mark after he retired. Evans died in 2007 of bone cancer. ↑ "2009–2000 Pro Football Necrology List". Pro Football Deaths 2007. Oldest Living Pro Football Players. 2012. Archived from the original on October 6, 2012. Retrieved July 22, 2012. 1 2 3 4 5 6 7 Baranick, Alana (June 23, 2007). "Fred Dippy' Evans, scored first points for Browns in 1946". Cleveland Plain Dealer. 1 2 3 4 5 "'Dipper' Evans Strives To Be Considered The Toughest Man on the Notre Dame Grid Squad". Reading Eagle. October 11, 1942. p. 13. Retrieved July 31, 2012. ↑ "Fred (Dippy) Evans". Pittsburgh Post-Gazette. October 18, 1941. p. 15. Retrieved July 31, 2012. ↑ Hoff, Dave (April 9, 1943). "Pro Football Teams Draft College Aces". The Telegraph-Herald. Associated Press. p. 7. Retrieved July 31, 2012. 1 2 3 "Dippy Evans To Play Pro Football Here". Cleveland Plain Dealer. May 13, 1945. p. C1. The Cleveland pro football team of the new All-America Conference, to be coached by Lieut. (J.G.) Paul E. Brown, yesterday announced the signing of another prize backfield prospect. He is Frederick Owen (Dippy) Evans, Jr., one of the best of Notre Dame's ball carriers of recent years. Evans is now a lieutenant in the army air corps and played last season with the crack Randolph Field team that was undefeated and won the national service title. ... Evans is the fourth player to be put under contract for the Cleveland team, which will start operation in 1946. ↑ Sauerbrei, Harold (August 31, 1946). "Browns Spot Brooklyn 13 Points, Then Rally to Triumph, 35-20". Cleveland Plain Dealer. p. 12. ↑ Sauerbrei, Harold (October 10, 1946). "Evans, Steuber Miss Yank Game". Cleveland Plain Dealer. p. 20. ↑ Sauerbrei, Harold (November 17, 1946). "Browns Mix With Improved Rockets". Cleveland Plain Dealer. p. 2C. ↑ "Buffalo Claims Evans; Terrell to Baltimore". Cleveland Plain Dealer. February 1, 1947. p. 13. Halfbacks Fred (Dippy) Evans and Ray Terrell of the Cleveland Browns were the choices yesterday of Buffalo and Baltimore, respectively, in the All-America Conference's player 'draft' designed to strengthen some of the weaker clubs in the circuit. ↑ "Fred Evans NFL Football Statistics". Pro-Football-Reference.com. Archived from the original on October 6, 2012. Retrieved July 31, 2012. ↑ "Fred "Dippy" Evans". Findagrave.com. Archived from the original on October 6, 2012. Retrieved August 24, 2012.